Can You Make Money Writing on Medium? Medium is the only platform on the Internet right now that allows anyone to sign up, post an article, and get paid earnings immediately. 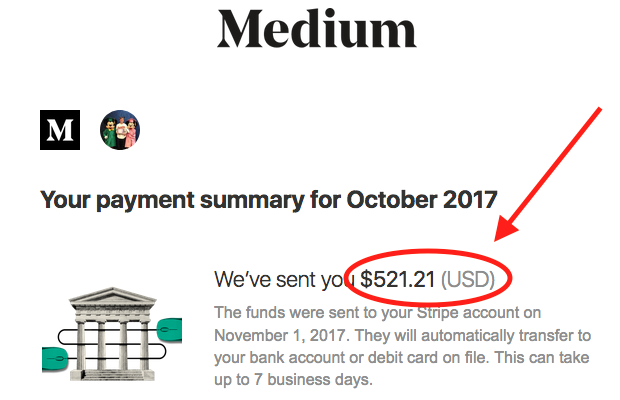 And yes — you definitely can make money through Medium’s Partner Program. The Medium Partner Program has been used by thousands of writers. However, the amount earned writing for Medium can vary widely. 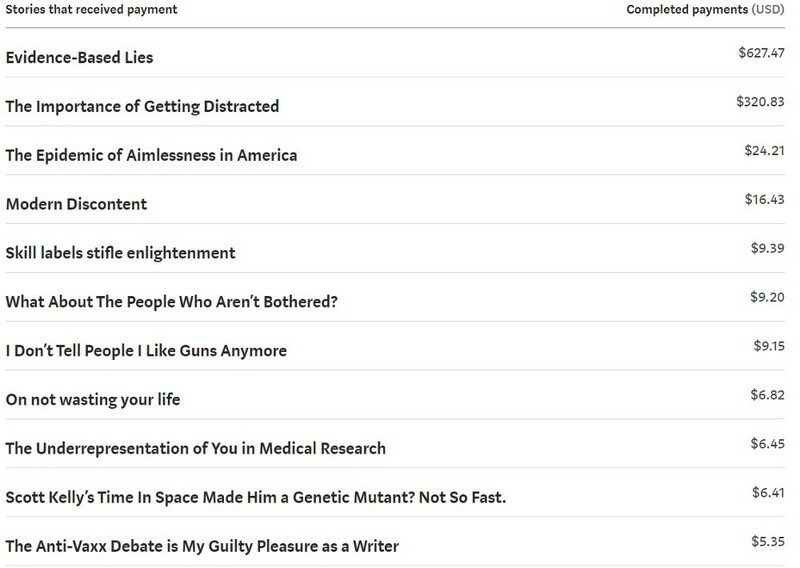 How Much Money do Writers Make on Medium? In the era of internet marketing and self help gurus, it’s hard to trust what you read online, especially if it involves earning money. So while this is by no means a thorough scientific answer, the following screenshots offer some testimonials about earning potential on Medium. Given that exceptional results are typically bragged about (and would subsequently by posted) I’m going to assume that these authors all experienced at least short term success that would place them in the upper 10–25% of paid writers on Medium. Another way to Estimate Medium Writer Earnings is to look at the data provided by Medium. 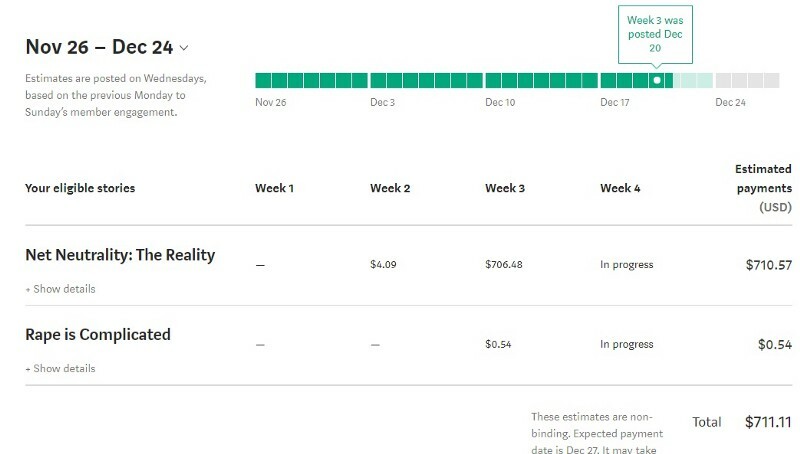 I’ve only just started writing on Medium but it appears that it is realistic for someone putting in decent part time writing effort to make $35–250 per month. I cannot say for sure, but given that the search algorithm weighs story recency so heavily, I’m willing to bet that a writer that can consistently produce marketable content could earn $500-$1500 per month without being featured by the site or major publications. If you can manage to be featured repeatedly, that is when you have the potential to earn thousands of dollars per month. How are Medium Payments Calculated? When you enroll in the Medium Partner Program (which is free and open to the public), you can start earning money with your Medium content. With Medium, users are able to read up to 3 articles per month. If readers want to enjoy any content past that limit, they must become a Medium member for the price of $5 per month. When Medium Members clap for an article, a portion of their $5 monthly subscription fee is paid directly to the author. Partner Program writers are paid every month based on how members engage with stories. Some factors include reading time (how long members spend reading a story) and applause (how much members clap). Each member’s $5 per month subscription is distributed proportionally to the stories that the individual member engaged with that month. In other words, you are paid per clap on Medium. Generally speaking, the more claps you receive, the more money you make. Each reader is limited to 50 claps per article (with no total clap limit across all articles they read). The confusing part of this payment system is that your payment per clap varies using a weighted average. Since clap payments are a fraction of a user’s $5 per month subscription fee, users who clap very frequently have lower paying claps than users who only clap a few times per month. This means a single clap ranges from $0.01 to $5 depending on who is viewing and clapping for your article. This assumes the person clapping is a paying member (non paying readers may create a free account and clap however these claps do not factor into your earnings). How Writers Actually get Paid Through Medium? Your Partner Dashboard is updated every Wednesday with what you’ve earned up until the previous Sunday. Your earnings are deposited into your bank account on the last Wednesday of every calendar month. Should I Lock my Articles and Make Them Exclusively Available to Members? This is a choice each writer must make based on their goals of reader engagement. Generally, by “locking” an article in the Medium Partnership Program, you will receive less views, reads, and overall engagement. However, articles that are not “locked” and are freely available to anyone may get more views but they are not eligible for payment. So if you are a new author it is probably worth at least experimenting with leaving a certain amount of articles “unlocked” to help gain exposure. Remember — you can always start off with an article being accessible to everyone and later choose to make it available exclusively through the Medium Partner Program (or vice versa). Do I Need to be a Previously Published Author or Professional Writer to Succeed on Medium? Partner Program stories are rewarded by readers who believe writers should be compensated for the quality of their ideas, not the attention they attract for advertisers or their status as a previously published author. So, no — you do not need to be a “professional author” to succeed on Medium. Do I Need to Promote my Articles Outside of Medium? Medium won’t be the right platform to promote all types of articles. However, certain industries have really great, established audiences. However, if you really want to boost your Medium article views, I would suggest sharing your article on other social media platforms. So while it is not necessary to promote your Medium articles on other platforms, it should certainly be considered to maximize traffic.